During Spring and summer months heating is generally only required to take the chill off later in the evening. During autumn and especially winter you should heat the marquee for a reasonable time before guests arrive to ensure a successful event. Blower or Space heaters require gas bottles and will heat large areas very quickly. They can be purchased or hired for very reasonable prices. 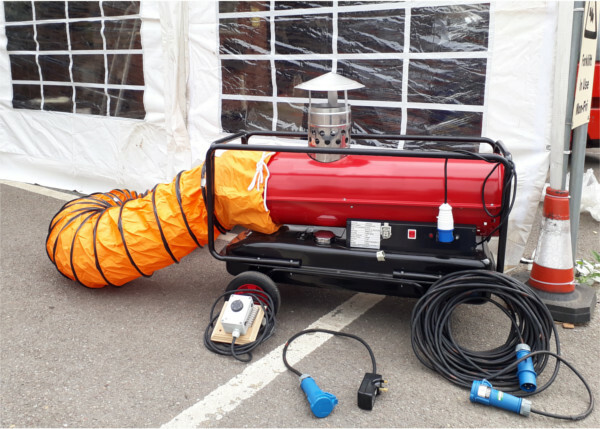 Ducted heaters also require gas bottles and sit outside the marquee with the warm air ducted in to the side of the marquee. These heaters generally include thermostats for ease of use, simply set the desired temperature and the heater will maintain the temperature in the marquee. Ducted heaters can be prohibitively expensive to buy so hiring is usually recommended. Indirect heaters are the most effective at heating up large spaces quickly and for a sustained period of time. 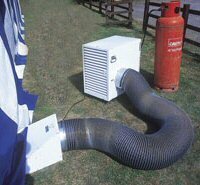 Usually powered by oil/diesel and are similar to ducted heaters in that they sit outside the marquee and the warm air is ducted in to the side of the marquee. Indirect heaters can be expensive to hire so if you are planning to use the heater more than three times it is reccomended to buy one. We also sell 25m 16amp extension leads as a product option to run power to the heater as well as a 16 to 13amp RCD plug as a safety device. All connections, extensions and RCD's are 16A / 240V Blue 3 pole plugs rated to IP44 and fully PAT tested. HO7 RN-F Black Rubber Cable is suitable for use at temperatures between -30 to +60 degrees C. This is a professional grade rubber cable often used for stage, outdoor events, workshops, underwater pumps, and harsh industial locations.